Link to the Last Will and Testament of David Gavin. Although he never had a family of his own, David Gavin managed the estates and properties of his three brothers and was involved in the lives of their children. Perhaps his most important legacy is his meticulous record of the people and events of his community from September 1855 until his death in January 1874. The first years are almost daily entries, describing life in St. George and surrounding communities, people and events, weather, slave stories, the abolitionist and secessionist movements, and the Civil War. The last years include some daily entries, legal documents, expenses, and the recording of deaths, marriages and births of people he knew. The Upper Dorchester County Historical Society has published the original David Gavin diaries, 1855-1874, including also his "trip diary" of his 1845 journey from St. George, South Carolina to Mississippi. Also a work in progress! 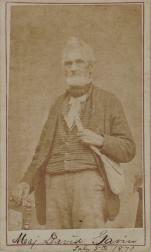 Charles Gavin was born in 1815 and married Martha Louise Tatum of Orangeburg County. The family migrated to Alachua County, Florida in the 1850's where his wife and infant daughter died in 1859. His surviving daughter, Anna Murray Gavin, was returned to South Carolina to be raised by her mother's sister. After the war, Charles Gavin migrated to Brazil and remained there until his death in approximately 1886. John Gavin was born in 1820. He married, first, Mildred Connor who died in 1843 giving birth to their daughter, Lucilla. About 1848 he married Mary M. Shuler, with whom he had six children. John died in 1858. On November 9, 1866, Mary Shuler Gavin and her young daughter, Ida E. Gavin, were murdered in Orangeburg. The surviving children are mentioned frequently in the diary. Dr. William Gavin was born in 1829. He married Martha Susan L. Moorer. They had three children, their youngest daughter, Ida William Gavin, born three months after her father's death in November 1861.